The Senate has voted against a motion calling on the government to change the date of Australia Day, with both the Liberal and Labor parties voting against it. The Greens motion called on federal, state and territory governments to change the date of Australia Day so that all Australians could participate in celebrating a national day. 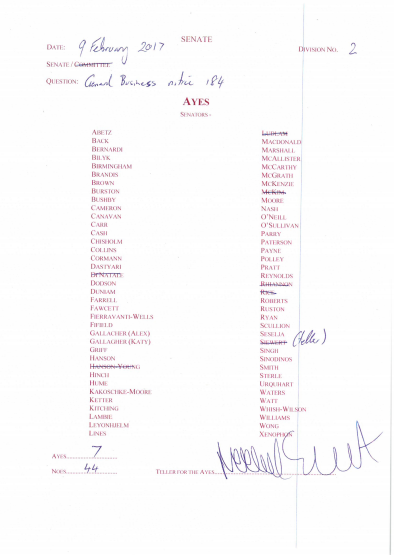 The only senators to vote in favour of the motion were seven Greens: Richard di Natale, Sarah Hanson-Young, Scott Ludlam, Nick McKim, Lee Rhiannon, Janet Rice and Rachel Siewert. The Greens accused all sides of parliament of purporting to advocate for Aboriginal and Torres Strait Islander peoples, only to turn their backs when given the opportunity to do something. 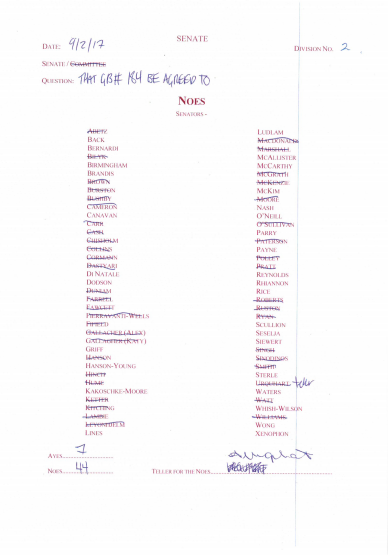 Here is a list of all 44 politicians who voted against changing the date. No-one from the Nick Xenophon Team was in the chamber to vote.